The final album from Tesla during their original run is actually a lot better than I initially thought it was. 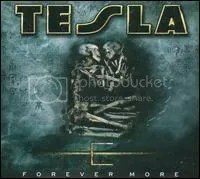 As if in answer to shifting tastes in the music industry, Tesla is a tad bit more dark and definitely heavier on this release but they still manage to retain their trademark classic rock-influenced blue-collar sound. Besides “Mama’s Fool”, most of the band’s flirtations with pop metal are gone. This isn’t my favorite Tesla album, but as usual, they always deliver solid hard rock, so there’s not much to complain about here either. It should be noted that even in the face of the emerging alternative rock scene this album still managed to go gold, but the band ended up going on hiatus anyway due to Skeoch’s substance abuse. 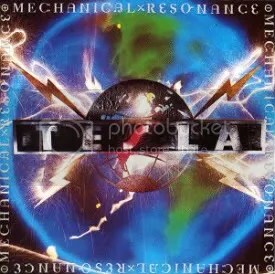 Tesla always delivers at least a respect effort on their albums, but this album (their debut) is easily one of their best. I think one reason I like it so much is because it is very much influenced by the pop metal scene. Tesla would later go on to sound like a 1970s band rather than a 1980s on future releases, but I’m sure it is this album that unfairly has them lumped in the “hair metal” category they are generally regarded t o be a part of. Even the titles hear are downright hair metal: “EZ Come EZ Go”, “Cumin’ Atcha Live” and “2 Late 4 Love” sound like song titles any glam metal band we be proud to call their own. Besides the hair metal connection, another noticeable difference is that Jeff Keith’s voice sounds less gritty here. I’m assuming age and just the fact that he wasn’t out there every night screaming at the top of his lungs while on tour has something to do with it. Don’t get me wrong there, this isn’t a total slick glamfest — shades of what was to come (the “real” Tesla, if you will) is definitely here, I think they just used a more polished and popular sound to get their foot in the door. Regardless of their intentions, they still delivered one heck of a debut. This was one of the soundtracks to the summer of ’07 for me. A lot of decent stuff came out that spring and summer and this was one of the albums I listened to. Honestly, though, it’s a good release, I don’t think it’s anyting special. These are covers of primarily 1960s/1970s blues rock (though a Temptations cover manages to sneak in) and therein lies the problem — I’m not a fan of those decades. I’m certainly not a fan of the 60s at all, though the 70s did start to kick things up a notch in that decade’s later years. Out of all the bands who are being covered, there are only four I have a passing interest in: Deep Purple, Thin Lizzy, Led Zeppelin, and UFO. Even then, I wouldn’t really call myself a “fan” of those bands. I’ve committed rock blasphemy, I know. So this album isn’t a home run (cover albums usually aren’t) but there are a few songs that held my interest. “Space Truckin'” is a great cover of the Deep Purple classic and Tesla does an amazing version of UFO’s “Rock Bottom”. The packaging for this album includs a spot for you to place to the CD of Real to Reel, Volume 2, which was initially only available by buying tickets to one of their summer concerts. It was later released commercially. The first thing I noticed about this album is the cover itself. Very metal feel and un-Tesla like. But still pretty cool and if they wanna put two skeletons kissing on their cover, who am I to complain? As for the music, it’s a more stripped down sound (meaning what you’re used to hearing from Tesla) than what was heard on Into the Now. 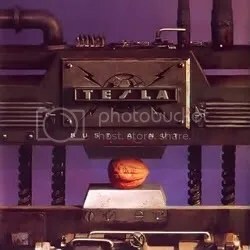 Tesla is still fusing their trademark sound with modern hard rock spectacularly, but they left all the effects at home this time, possibly feeling a ‘back to basics’ buzz from their 60s/70s rock Reel to Reel cover albums. A lot of the riffs here are still very modern though and I say it all the time about these veterans bands, if it was a new, younger band releasing these songs, they’d be radio hits. It’s unfortunate the music business rarely gives older talent a second look unless you’re so big that you can’t be ignored (AC/DC, Metallica, Ozzy, etc). Most of the album is a highpoint, except for some of the slower songs scattered throughout. “Forever More”, “I Wanna Live” and “Breakin’ Free” are the standouts here and are what I’m talking about when I say they have hit potential. Forever More doesn’t match the magic that was Into the Now, but it comes pretty close and that’s good enough for me. One of the year’s best releases. 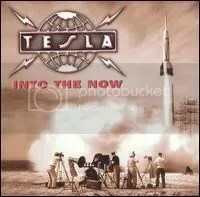 Tesla has perfectly blended modern hard rock with their signature sound with songs like “Into the New” and “What a Shame”. And what a shame, indeed, that this album went relatively unnoticed. The album is very well-balanced with great ballads (“Caught in a Dream”, “Words Can’t Explain”, “Come to Me”, “Only You”) and wonderful heavy rockers (“Mighty Mouse”, “Got No Glory”, “Look @ Me”) and even manages to blend both with the awesome “Miles Away”. A must have for Tesla fans as the band successfully proved themselves as more than just a good “80s band”… They’re a good rock band, period. Highlights: Not a single filler track at all. One of 2004’s best releases and possibly Tesla’s best, for my money.